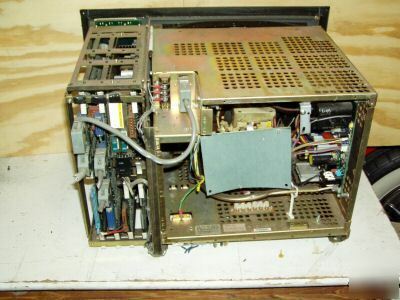 Here is a Fanuc 150 T MDI/CRT Unit thta slide into the opening on a CNC Control Cabinet. 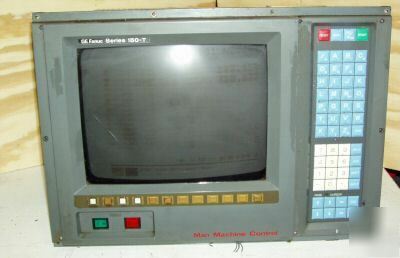 Part number for the assembly is A02B-0087-C208 and has a 14" CRT included. The indivual part numbers are: Keyboard: N860-3122-T001/01A, 14" CRT: Matsushita A61L-0001-0074A TX-1450 ABA, POwer Supply: A20B-1001-0930/01. 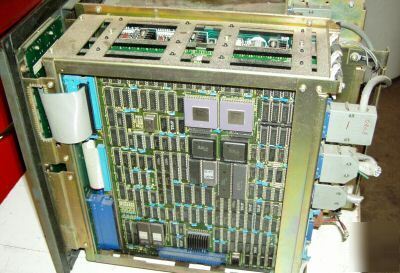 CRT Board A20B-1002-0710/07B, CPU Board: A20B-1002-070 / 03A, 512KB Ram Board: A20B-1001-0882/02A, ROM 1MB Board: A20B-1001-0870/02A. Came off a salvage job a buddy of mine did. Machine was working fine till shut down. Would be a great spare or a cheap replacement. Comes with a 7 day return privledge if arriving Dead on arrival. It will come in two seperate boxes so the CRT arrives undamaged. Check out my other listings and come back often as pieces are always changing. I am also listing a whole bunch of machinery books. Thanks for looking.